As if entering one photo competition a month wasn't bad enough I've decided to enter another. My regular competition is over at AVForums.com. I've entered pretty much every month since Sept 2004 and have been lucky to win 4 times. Just recently I discovered in the photography section of Sheffieldforum.co.uk that they also run a monthly photo comp. So last month I entered this photo and I was lucky enough to win. So it seemed a bit rude not to enter this month. The theme for this month is "wheels" so I decided today to take a photo of my bike at sunset. The best view of the sunset to me is just over a mile away on Jawbone Hill. There is a lay-by there so I initially thought I would drive out there with my bike on my bike rack. It then dawned on me that despite the journey being mainly up a very steep hill - and more importantly the fact that I am very unfit - that I should ride my bike up there and ditch the car. So I did. Blimey, was I tired and breathing very hard by the time I reached the top! But I was very proud that I made it. When I arrived the sunset was about 45 minutes away but the view was stunning. 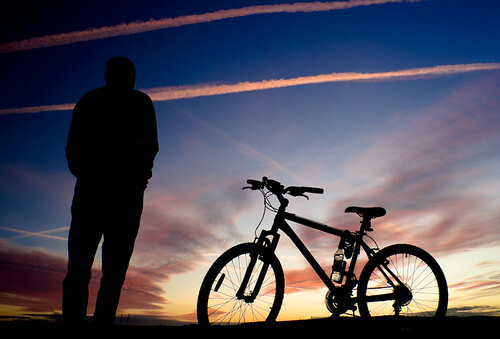 I then tried to position my bike so it was silhouetted against the sky. This was more difficult than it sounds as the sun was setting behind a hill in the distance that is higher than Jawbone Hill. Therefore no matter where I placed the bike I couldn't put the camera low enough to cut out the hill in the distance. I also realised that I really needed an ultra wide angle lens like the Sigma 10-20 to fit everything in. But as I don't have £300 I had to make do with my crappy kit lens. But after about 30 minutes of trying I finally found an angle that worked and the photo above was the result. I am very happy with it and will be entering this in the competition. Wish me luck with it blog fans. EDIT: the mystery man pictured in the photo is in fact me. I used the self timer on the camera to allow me to be in the shot.